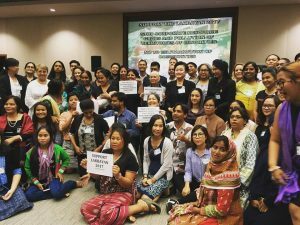 “We heard a lot from our colleagues on their experiences and struggles from the ground—how pollution and lack of access to resources are hindering them from development. We hear how indigenous communities are being displaced away from their ancestral lands and natural resources, how farmers, fisherfolks, women, children, LGBTIQ, workers, migrants, urban poor, and all marginalized groups, are being dispossessed of their rights to their environment and their natural resources,” shared April Porteria of CEC and also the coordinator of APRCEM’s Environment Thematic Working Group. Representatives of civil society groups and people’s organizations shared their experiences on different pollution issues across ecosystems in the region such as in air, water, land and even cross-cutting pollution issues of industrial and military pollution. Another highlight of the activity is the stress on movement building in terms of addressing different pollution issues and the urgent need to address systemic barriers hindering people’s access to justice and development. “Movement building is a key to our struggle. That is being done with community education and organizing. We need to be very strategic in our struggle, we should not leave any space hence engaging UN and international process is also important but keeping in mind that this is not all, we also have a huge task outside—in our communities, in villages and small towns,” said Wali Haider of Roots for Equity (Pakistan). Forum participants also showed support to local struggles in different parts of the region including the on-going Lakbayan of Pambansang Minorya 2017 (Indigenous People’s Caravan 2017) in the Philippines where issues of displacement, militarization, environmental degradation alongside with extreme poverty and marginalization are highlighted.